Researchers from the University of Leeds are contributing to a 30-month autonomous vehicle project that will culminate in the most complex journey yet attempted across the UK without driver input. 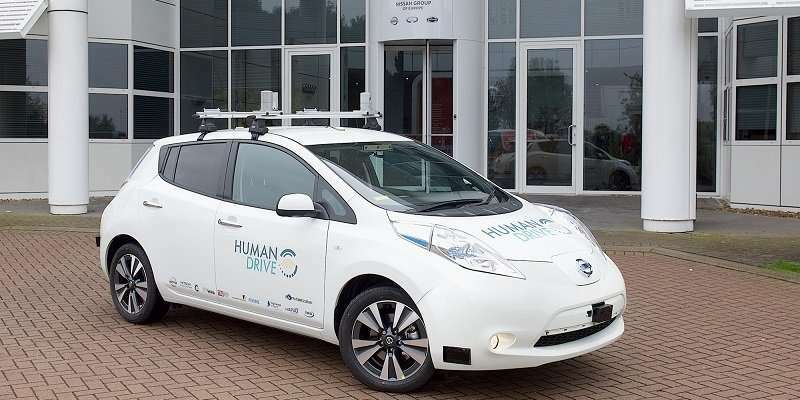 The 'HumanDrive' project is led by Nissan's European Technical Centre, as a part of Renault-Nissan Alliance research activities, and will include expertise from the Institute for Transport Studies at Leeds, to develop driverless vehicle technologies that can deal with varied UK driving scenarios. Professor Natasha Merat from the Institute for Transport Studies is the principal investigator for the project research based at Leeds. Professor Richard Romano, also from the Institute for Transport studies, will oversee the use of the University of Leeds driving simulator (UoLDS) for HumanDrive research. Professor Merat said: "The project aim is for the HumanDrive car to travel in a way that would appear human to the outside world, navigating through all road types and driving conditions. "While there are many vehicles around the world that have some self-driving features, such as self-parking or cruise control, integrating human-like driving to driverless vehicles will provide a smoother, more comfortable experience for drivers. Our algorithm development is trying to achieve this along with an understanding of what people want from an automated driving experience"
Professor Romano said: "Underpinning the HumanDrive car's automation will be our team's analysis of studies from drivers on the road and in our simulation. These will identify characteristics of natural driving and risk factors which influence driver behaviour and will be used to develop a control model capable of mimicking how a human driver reacts to risks in real time. "The UoLDS studies will help understand the degree to which drivers prefer an autonomous driving style that is human-like and if they prefer a style that mimics their own. This will inform how human-like and how personal an autonomous vehicle should behave." "This project highlights the capabilities of Leeds' new Virtuocity centre, and its ability to integrate externally-developed automated vehicle control software in the simulation environment and rapidly generate geo-specific databases and perform simulation-based testing of driverless cars." The HumanDrive project will conclude in December 2019 with the 'Grand Drive': a 200 plus mile journey through a variety of settings, including country roads and motorways. It will also be used to increase public awareness of and confidence in autonomous vehicles and enable authorities responsible for road networks and safety to benefit from developments in automated transport system technologies. Greg Clark, Business and Energy Secretary, said: "Low carbon and self-driving vehicles are the future and they are going to drive forward a global revolution in mobility. This revolution has the potential to be worth £52bn to our economy by 2035 and the opportunity to be at the forefront of this change is one we cannot afford to miss. "Through our Industrial Strategy and the Automotive Sector Deal investment in the development of driverless technology we are committed to working with industry to seize these opportunities. "Trailblazing projects like the HumanDrive project will play a vital role helping us deliver on that ambition, with UK businesses and research institutions working with partners from around the world on the disruptive technologies and services of the future." Mark Westwood, Transport Systems Catapult Chief Technology Officer, said: "This pioneering project will considerably enhance the experience of drivers who use future autonomous vehicles. We've only just scratched the surface in terms of the capability of machine learning and AI in driving. "The HumanDrive project further reinforces the UK's commitment to be at the forefront of future mobility, and as a world leader in R&D. We are delighted to be working with world-class partners on this project to ensure autonomous vehicle technology provides users with the utmost comfort and control possible."